1. Remove the parts shown. вЂў Upper fender trim (see page 20-277) вЂў Front bumper (see page 20-255) вЂў Front bumper absorber (see page 20-255) 2. Remove the three bolts, and pull the headlight (A) out slightly. 3. Remove the harness clip (B) from the headlight housing, and disconnect the connectors (C) from the bulb sockets. 4. Remove the headlight with the corner upper beam (D). NOTE: Be careful not to scratch the headlight lens and the fender. 5. 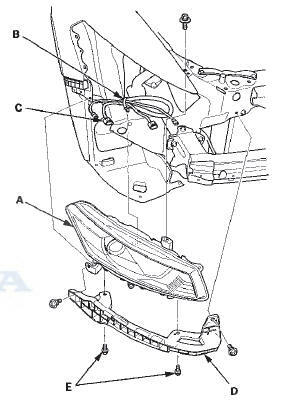 Remove the two bolts (E) and the corner upper beam from the headlight 6. Install the headlight in the reverse order of removal. 7. 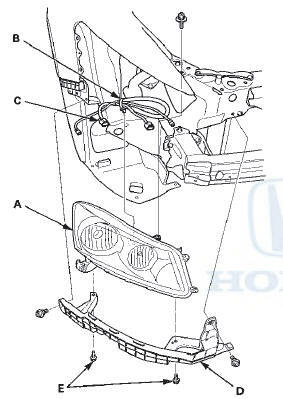 After replacement, adjust the headlight (see page 22-233). вЂўUpper fender trim (see page 20-277) вЂў Front bumper (see page 20-255) вЂў Front bumper absorber (see page 20-255) 2. Remove the three bolts, and pull the headlight (A) out slightly.